Emirates SkyCargo, the freight division of Emirates has expanded its network of cargo destinations in the United States with the launch of a new daily service to Fort Lauderdale, Florida from 15 December 2016. Fort Lauderdale is Emirates SkyCargo’s 13th destination in the United States and its second in Florida. The daily Dubai- Fort Lauderdale route is operated by a Boeing 777-200LR and offers up to 15 tonnes of belly-hold cargo capacity per flight. 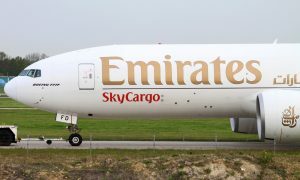 Emirates SkyCargo also offers belly hold cargo capacity on its daily service to Orlando, Florida bringing the total cargo capacity offered to the state to over 330 tonnes per week. Emirates flight EK 213 departs Dubai at 0330hrs local time and arrives at 1055hrs local time at Fort Lauderdale. The return flight EK 214 departs Fort Lauderdale at 2020hrs local time and returns to Dubai the following day at 1940hrs local time. The inclusion of Fort Lauderdale to its US network will allow Emirates SkyCargo to open up trade opportunities and provide additional connectivity to its cargo customers in South Florida and the broader region. Customers will be able to access global markets and connect to trade partners through Emirates SkyCargo’s network of over 150 destinations across 82 countries in six continents. The top exports from Fort Lauderdale are expected to include healthcare equipment including surgical and laboratory equipment, pharmaceuticals, electronics, aerospace components, aviation and shipping spares, perishables including cheese, seasonal fruits and vegetables and mail. Top imports into the region are likely to include pharmaceuticals, aerospace components, electronic and electrical goods. Emirates SkyCargo facilitates trade between the United States and the rest of the world by offering belly hold cargo capacity on passenger flights to Boston, Chicago, Dallas, Houston, Los Angeles, New York, Orlando, San Francisco, Seattle and Washington D.C. The carrier also operates freighter services to Atlanta, Chicago, Columbus, Houston, Los Angeles and New York. Emirates SkyCargo offers a total cargo capacity of over 2000 tonnes per week from the United States. For the financial year 2015-16 Emirates SkyCargo uplifted over 90,000 tonnes of exports from the world’s largest economy. The diverse range of exports from the country included cherries from Seattle, fresh seafood and medical equipment from Boston, pharmaceuticals from Chicago, oil and gas equipment from Houston and engines and aircraft parts from Atlanta. In 2016 Emirates SkyCargo also transported thoroughbred horses to and from the United States on dedicated freighter flights for prestigious equestrian events. Emirates SkyCargo offers specialised and innovative transportation products for temperature sensitive products such as pharmaceuticals and perishables. In addition to extensive state of the art cool chain facilities at its dual cargo hubs in Dubai International Airport and Dubai World Central, the carrier also operates the world’s largest multi airport hub for transport of pharmaceutical products certified under European Union Good Distribution Practice (GDP) guidelines. The carrier operates a modern fleet of over 245 wide-body aircraft that includes 15 dedicated freighters- 13 Boeing 777-Fs and two Boeing 747-400ERFs.